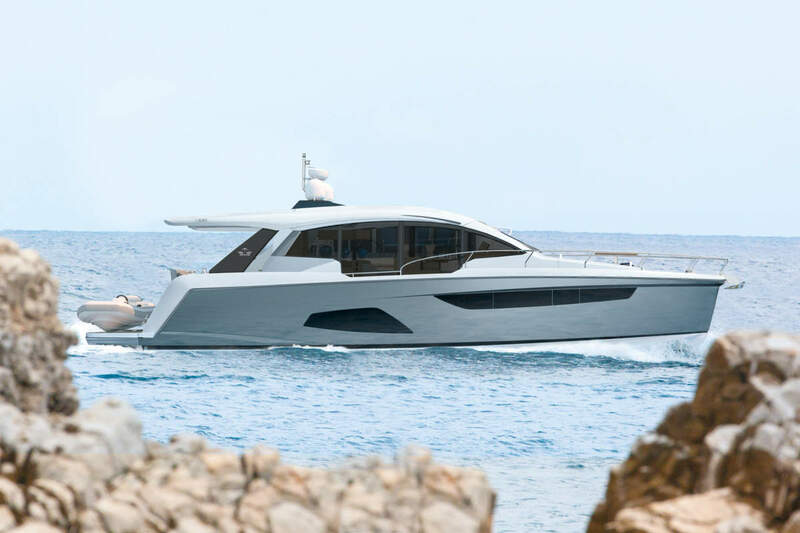 Designed by V. Garroni, the Prestige 39 holds her own while featuring the design elements and innovation, the comfort onboard and the seaworthiness that have forged the success of the Prestige line. The new Prestige 39 is distinguished among 12-metre motor yachts by two significant design innovations: a saloon with a large panoramic view of the sea and an ergonomic cockpit. With its large glass surfaces, the spacious saloon affords an abundance of bright natural light and a 360º view of the sea. 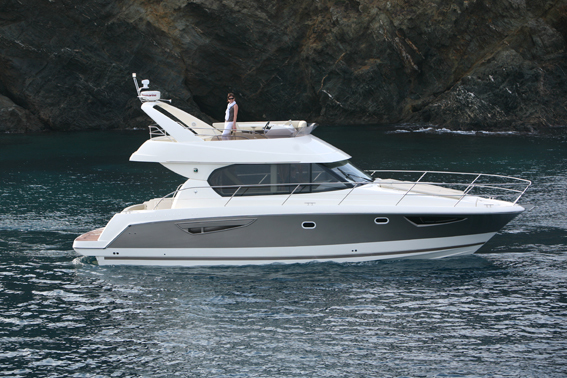 The new-generation flybridge will surprise you with its dimensions and architecture, including: an ergonomically designed steering station, a vast cockpit with dining area, an integrated sofa, and a sundeck that is well shielded from view and from the wind. 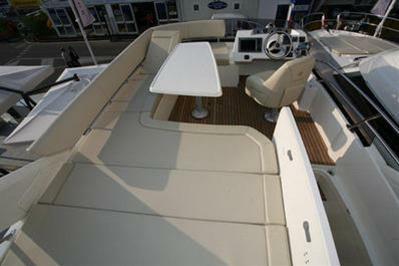 Design elements such as these make this flybridge a new Prestige signature model. 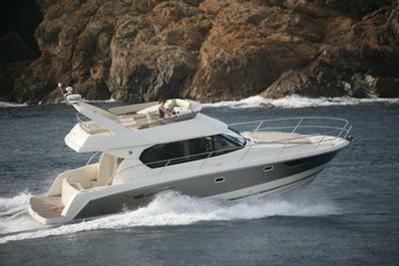 The Prestige 39 boasts a new hull design by Michael Peters to guarantee excellent seakeeping and the comfort of all onboard. 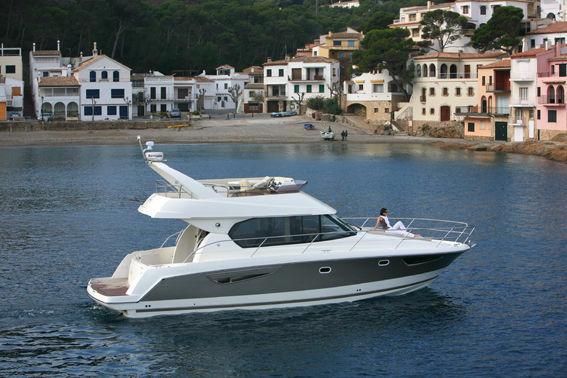 New for 2010 the Jeanneau Prestige 39 Flybridge offers 4 berths in 2 cabins plus 2 separate toilet/shower compartments. With her “opening on the sea” design concept, perfectly composed flybridge and 2 cabins with private head and shower compartments, she features a resolutely innovative approach to comfort. For these reasons, the Prestige 39 will quickly become head of her class, setting an example as the most comfortable and luxurious flybridge on the market of motor yachts under 40 feet. 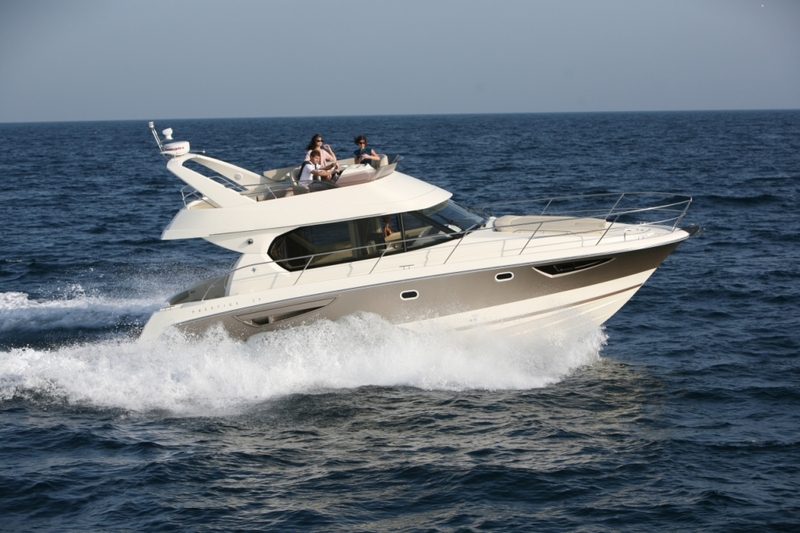 This prestige is great and so much going for it for such a small flybridge, very spacious and a worthy contenter when thinking of a small flybridge sports cruiser, great review keep them coming WSB!